Are you someone who leaves your disposable contact lenses in for longer than you're supposed to? It's a pretty accepted fact that things are just plain better when they are at their freshest. You won't be surprised to hear that the same idea applies to your contact lenses. 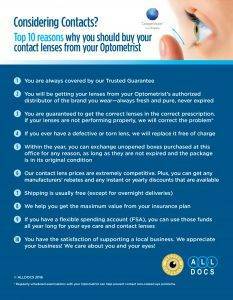 You should never leave your contacts in for any longer than you need to. Despite that fact that you might be tempted, if you want your eyes to see their very best, adhere to the replacement and wearing regime recommended to you by your optician. This means that if you've been told to replace them daily, change them daily, because they're not made to be worn any longer than they're supposed to. You might think to yourself, can't I get a few extra wears out of them? To answer this, let's talk about protein – not the dietary kind, but the natural protein contained in your eye fluids that builds up gradually on the surface of your lenses, creating a light haze. Blurry vision is only the first symptom. After some time, these proteins evolve and make your immune system think the accumulation is something foreign, and the body's reaction can result in inflammation in the eye. This leads to a situation where your vision won't be working at its best. External particles like pollen or dust can also accumulate on the lens, which also makes vision blurry. Even if you take the best possible care of your contacts, eventually they'll become less smooth and clear, due to normal deterioration. So commit to the schedule your eye care professional advises for you. Everyone's eyes are unique, so only your eye care professional should determine the correct contact lens replacement routine for you. If you change your contact lenses on time, you'll never even recognize the difference that is so apparent when you overwear them.